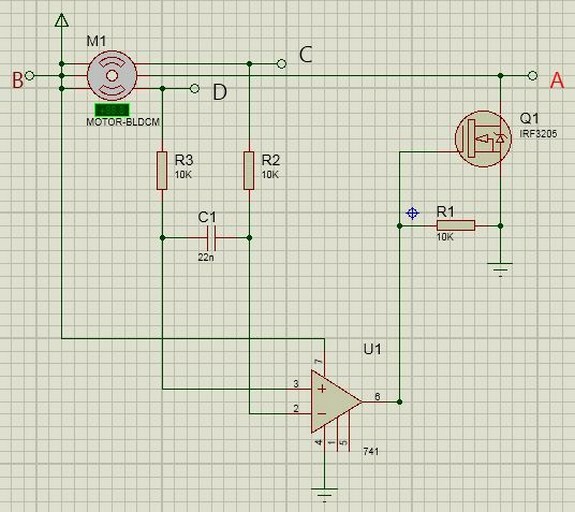 Circuit schematic like in Figure 1 above is Simple Circuit Schematic Brushless DC Motor Driver using LM741 and MOSFET IRF3205. According Prinsipkerja site describe that this circuit works only on a hard drive or BLDC (brushless dc motor) which has four pins (3 phase signal and one common), and for motors with 3 pin can not use this circuit. In the above schemes exist points A, B, C and D are connected to the BLDC motor, may be any hard drives have different pin configurations but as this reference pin placement is used..
IC LM741 is an Op-amp, which is used as a voltage comparator. At the time the motor is rotated by hand using a motor disk itself produces a small electric fed to input-1 op-amp that resulted MOSFET on and then the motor moves the motor movement resulted in the induction coil further that then produces electricity that is fed to input-2 which resulted MOSFET off, this process keeps repeating and causing motor spinning faster and faster until it reaches the maximum speed. Read more here.